Amazon.com’s India Marketplace amazon.in is launched with a lot of offers; some of them are expired (Eg. Kindle book give away) and some of them are running (free delivery for any purchase). Other players in the marketplace are on their toes to sustain their place. Flipkart, one of the largest and popular local player is trying to get more traffic to their website via affiliates. It have increased the commission rate for the affiliates to flat 10% (for most of the categories) for July 2013. They are hopeful to see more traffic driven to their online store with this campaign. It is worth to note that Amazon is also having affiliate program and it is available in India also. Amazon India’s affiliate commission rates are good too. So, this strategic move by Flipkart still has a competition. (Even Infibeam is running affiliate program, as the matter of fact). And it seems wise decision by Flipkart, as they are running this program for a month, if they will see significant growth in their business they may continue it. Webmasters usually earn via affiliate banners and advertisements on their blog/website. So this competition between these big players offer them an opportunity to earn a little more. 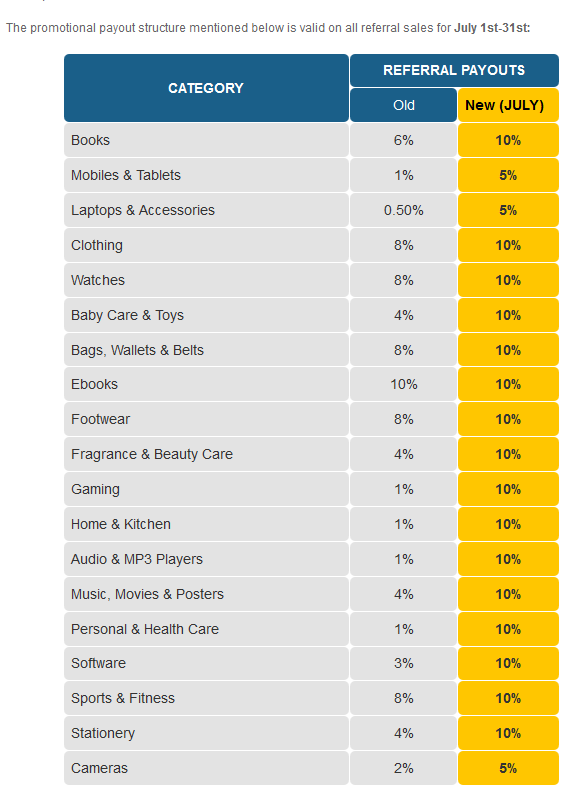 Here are updated commission rates by Flipkart, for your reference. Do let us know your remarks about this marketing step by Flipkart.